This mildly engaging documentary would serve as a decent introduction to the architectural work of Norman Foster, but it barely scratches his surface, so you won't come out of it with more than a few insights. If you want to know some basic background info about Foster, like how and why he became an architect, how he and his firm struggled financially, and what kind of buildings he's design, well, now's your chance. Much of that info is fascinating, but only up to a certain point when you start to wonder the one question that every documentary should answer thoroughly: "So what?" By the 100th time that someone speaks highly of Foster, you'll begin to wish that co-directors Norberto López Amado and Carlos Carcas had taken a step or two backwards to avoid getting so close to Foster. That's one of the many challenges of any great documentarian because, at the same time, the interviewers want to earn their subject's trust to get revealing info from them, so they have to get somewhat close to them while remaining respectful. They should have asked more provocative questions, though, because the little bits of info coming from Foster aren't particularly surprising or revealing for that matter. For instance, Foster states that triangles are very strong shapes in the world of architecture, and that he tries to design buildings that look pleasing to the eye and stand out---then again, what architect wouldn't say that about himself? If you look at Foster's architecture, he does make a lot of uses of triangles, but a good question that should have been asked is why not use more round shapes? Even on a purely scientific level, one's eyes tend to feel more at ease when looking at circles rather than triangles, squares, etc. 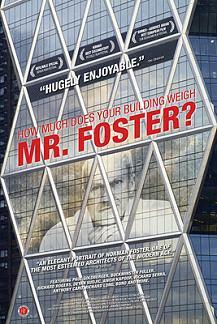 Perhaps the co-directors should have learned more about architecture before interviewing Foster in order to ask sharper questions in response to Foster's remarks which would probably have made this documentary much more insightful and memorable. Number of times I checked my watch: 2 Opens at the IFC Center.Released by First Run Features.